The Royal College of Music, one of the world’s great conservatoires, has chosen DeepStore to house its library’s Special Collection. The three-year contract was awarded to DeepStore, the UK’s largest underground storage company, after a procurement tender exercise. The Special Collection includes composer and performer archives, and around 750,000 programmes from the 19th through the 21st centuries that are frequently recalled by users of the library. The Royal College of Music began working with DeepStore in 2016 and following the completion of the initial intake of material, embarked on a tender process for a low-risk storage and retrieval system for its Special Collection – the key requirements being a high-level of security, and a temperature and humidity-controlled environment. The highly secure storage facilities,150 metres below the surface in Britain’s largest salt mine, are not only naturally free from UV light, flooding and vermin but also offer consistent temperature and humidity levels and comply with PD 5454 requirements. 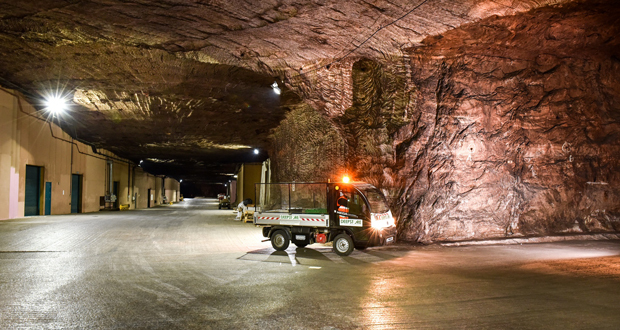 The unique underground storage facility (an area 700 times the size of Wembley football pitch) was created from the space left following the extraction of millions of tonnes of rock salt. The mine, which is owned and operated by DeepStore’s parent company, Compass Minerals, has the capacity to extract 1.5 million tonnes annually. Next: Forbo’s new Tessera Cloudscape: Expressive. Calming. Reflective.